The contemporary look of this Safavieh Courtyard area rug adds style to any room. Designed for your hallway, dining room, or living room, this indoor/outdoor piece made from plush synthetic material looks and feels great. This machine-made rug is durable and modern. This blue rug has a fashionable geometric pattern to add some flair into your home. Add this Safavieh Courtyard area rug to your hallway, dining room, or living room for an infusion of style. Make your hallway, dining room, or living room more stylish with this indoor/outdoor plush synthetic rug. The machine-made construction of this area rug is sure to withstand wear and tear. This blue rug with its floral plants pattern is modern and stylish. 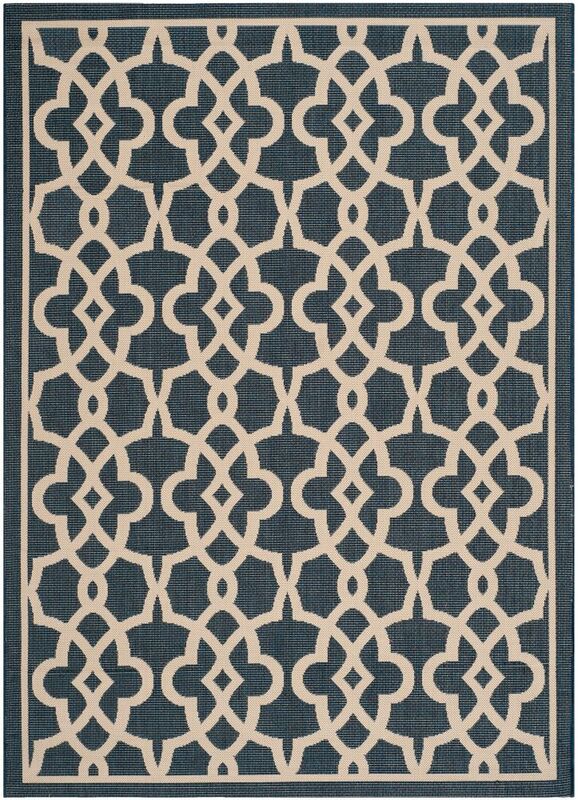 Courtyard Blue 5 ft. 3-inch x 7 ft. 7-inch Indoor/Outdoor Rectangular Area Rug - CY6071-268-5 The contemporary look of this Safavieh Courtyard area rug adds style to any room. Designed for your hallway, dining room, or living room, this indoor/outdoor piece made from plush synthetic material looks and feels great. This machine-made rug is durable and modern. This blue rug has a fashionable geometric pattern to add some flair into your home.